After four long years, it’s finally here: the Fuji X-Pro 2. Fuji fans have been waiting for an update to the original X-Series interchangeable lens camera for a long time, and Fuji has seen fit to update quite a bit with this new rangefinder-styled flagship. While the exterior of the camera looks very similar to the original X-Pro 1 released in 2012, the X-Pro 2 has the first all-new image sensor for the series and a host of new features, most of which center around the controls of the camera. I was excited to get my hands on the X-Pro 2, and after running it through its paces the past two weeks, I’m excited to tell you about it. The X-Pro 2 stays true to the original styling and construction of the X-Pro 1. If you were to quickly look at both cameras, you’d be forgiven for failing to notice any differences. 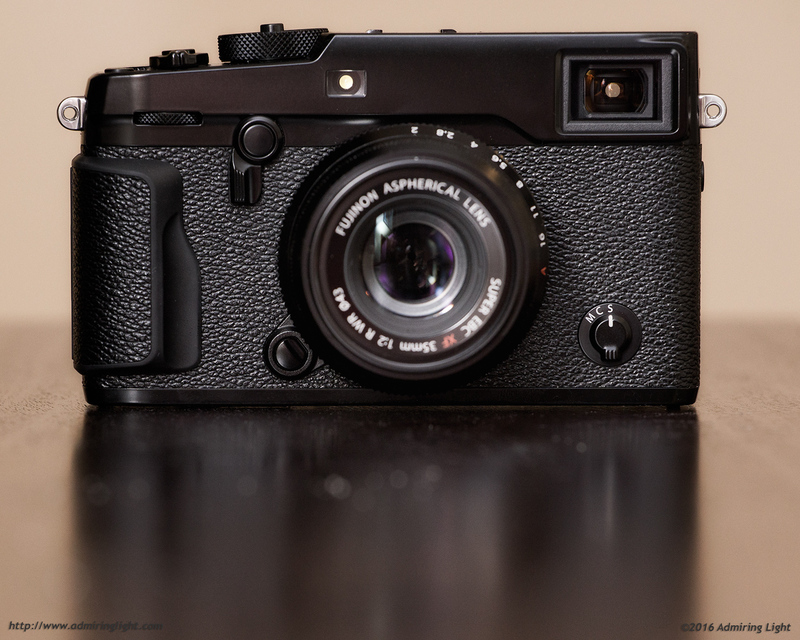 The X-Pro 2 is solidly constructed of magnesium alloy, and Fuji’s done a great job putting together a package that feels tight and very high quality. The metal top and bottom plates are single piece items, with no seams to be found. There are no creaks or points of flex anywhere on the camera body. Fuji has also added weather sealing, such that it should hold up to shooting in light rain when using a WR designated lens. The center of the camera is covered in the classic black leatherette to add even more to the retro styling. Concerning that styling, the X-Pro 2 truly looks like a classic rangefinder. It doesn’t have a rangefinder mechanism, but the hybrid optical/electronic viewfinder sports a large front window, and the classic dials of the Fuji X-Series interface cement the retro look. It’s truly a beautiful camera, in my opinion. Fuji’s even replicated the old self timer lever on the front of the camera, as it did with the X-Pro 1, though in both cases, the lever serves to switch the operation of the viewfinder rather than set a mechanical timer. Fuji isn’t a slave to tradition, however, as they’ve thoughtfully modified the original X-Pro design to add some extra grip and improved shooting ergonomics. The front grip is similar in depth to the X-Pro 1 and the X-E1 and X-E2, but it adds a soft tacky rubber edge where your fingers fall. This rubber edge is duplicated on the rear thumb grip as well, and while it’s a subtle change, it’s one that adds excellent purchase to the grip of the camera. While some will want a more substantial grip, especially with some of the larger Fuji lenses, for most shooting I found the grip to be perfectly adequate. The camera fell naturally into my hand, with easy access to almost every control. For those who want a larger grip, Fuji sells a metal hand grip that extends the front handhold and adds an Arca-Swiss style dovetail for use with most premium tripod heads. The buttons on the X-Pro 2, despite having weathersealing, feel much the same as those on the X-E2, rather than the mushy buttons of the X-T1. Response is firm and clicky, while the top dials move with excellent firmness to resist accidental activation but still offer easy manipulation. The only ergonomic concern was the rather thin nature of the front and rear command dials. These small dials don’t have particularly firm detents, and while both are pressable, they lack the firm response of earlier Fuji command dials. I’ll get into the newest feature: the focus stick, in the controls section, but for ergonomic concern, it’s well placed and very easy to use. In all, Fuji did a great job with construction and handling on the X-Pro 2. It’s a classic design, but with some modern touches and a design that makes it easy to get the shot. The X-Pro 2 has changed a lot from its predecessor, but gains almost all the features of the X-T1, plus a few more. While there are some unique features on the X-Pro 2, they are almost entirely focused on improving the usability of the camera and simply getting the shot. This starts with the controls. The main control scheme is similar to almost every other Fujifilm camera out there. The aperture is controlled by the ring on the lens (for most Fuji lenses), while shutter speed is controlled by the dedicated dial on top. 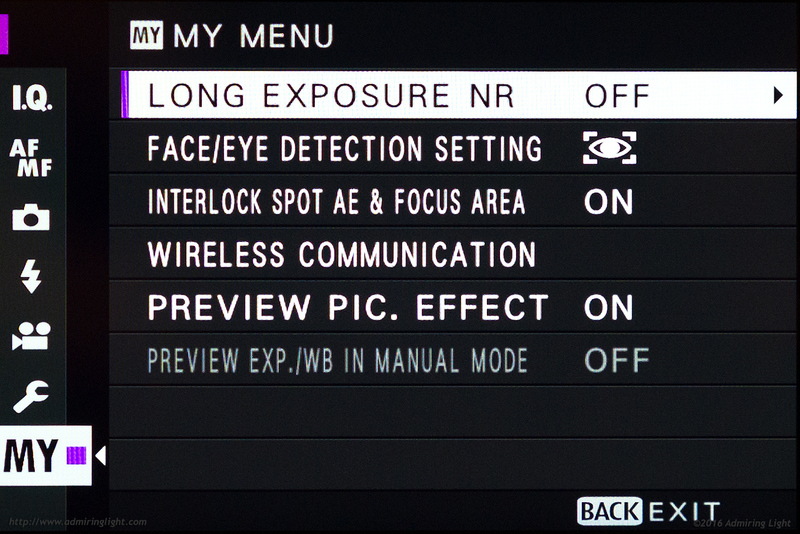 Exposure compensation is controlled via a dedicated dial on the right side of the body. The X-Pro 2 features two command dials as well, which can operate 1/3 stop intervals of shutter speed, or adjust aperture for those lenses that lack an aperture ring. The command dials also can take over exposure compensation duties as well, if the dedicated dial is moved to the new ‘C’ position. This also allows EC to be adjusted up to + or – 5 stops instead of the maximum of 3 offered by the dedicated dial. One oddity that occurs in this ‘C’ mode is that pressing in on the front command dial switches the EC control away from it. If you’re in Program mode (both shutter speed and aperture set to ‘A’), this command dial will then control the program shift of aperture and shutter speed, but if you aren’t, it simply disables the control entirely until you press it again. The rear command dial is also pressable, and like earlier Fuji cameras, pressing acts as a magnification button, both in image review and when shooting with the rear screen or the EVF. 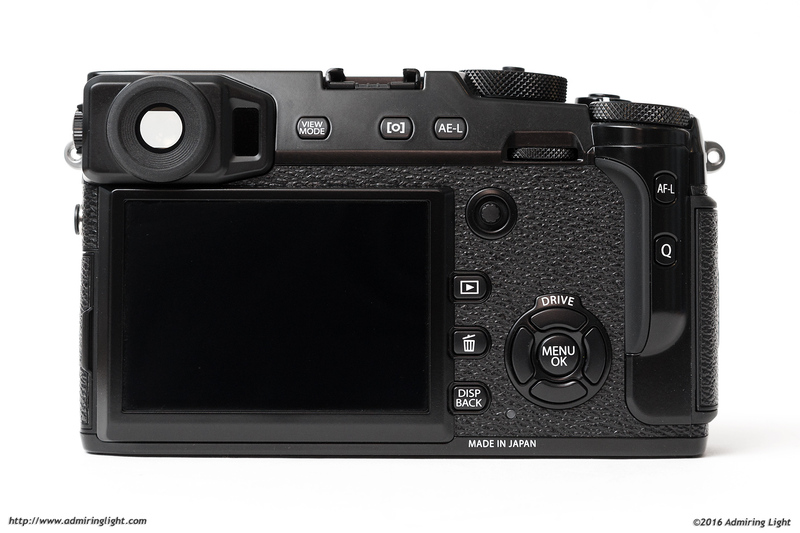 The final dial control is ISO, and like the X-T1, the X-Pro 2 features a dedicated ISO dial. However, the X-Pro 2’s ISO control is built into the shutter speed dial. In a nifty bit of engineering that harkens back to film cameras, lifting the edge of the shutter speed dial allows you to change the ISO. This works just fine, though it’s a bit more fiddly than the more standard dial on the X-T1, and has a big downside of losing tactile feedback: you can’t tell how far you’ve moved the ISO dial by feel, so you’ll need to watch the display if you’re changing ISO in dark conditions. I would rather have this control than move ISO to a button like on many other Fuji cameras, but the implementation is a step down from the dedicated control on the X-T1. The rear of the camera has a similar array of buttons to many other X-Series cameras, but instead of splitting some of them to the opposite side of the camera like on the X-E2, everything is within reach of your thumb with the X-Pro 2. This improves handling in the field and makes the camera easier to work with. While these improvements are great, the single best new feature with regards to controls is the new Focus Stick. The Focus Stick is an 8-way joystick that sits just to the left of where your thumb rests when holding the camera, and it is something that I hope will be coming to all future Fujifilm camera bodies. The stick provides direct control over focus point positioning, which not only makes choosing your focus point significantly faster and easier, but frees up the four buttons on the four-way controller to be used for other actions. The stick is quick and responsive, and makes switching focus points extremely simple, even when using the viewfinder. Pressing in on the stick twice will reset the focus point to the center, and pressing the stick during image review allows you to easily switch between the two SD cards that can be placed in the X-Pro 2. After using this method for focus point selection for even a day, I was absolutely sold. It’s my favorite improvement on the camera, as it simplifies shooting and speeds up operation significantly. One big change that Fuji implemented for the X-Pro 2 is a new menu system. Instead of the old system that grouped things into catch-all ‘camera’ pages and ‘setup’ pages, the X-Pro 2’s menu breaks up the options into Image Quality, Focus, Still shooting options, Flash, Video and Setup. The resulting menu system is easier to navigate and is more logical. They’ve also added a new page called ‘My Menu’, that allows the user to select specific functions from any of the other menu sections for easier access. Above, you can see the options I’ve chosen to put in the My Menu. In all, the changes to the X-Pro 2 almost universally enhance the shooting experience, and yet will be very familiar to existing Fuji shooters. These aren’t earth shattering changes on a spec sheet, but when taken together, the control scheme on the X-Pro 2 is predominantly excellent, and a big step up from earlier bodies. 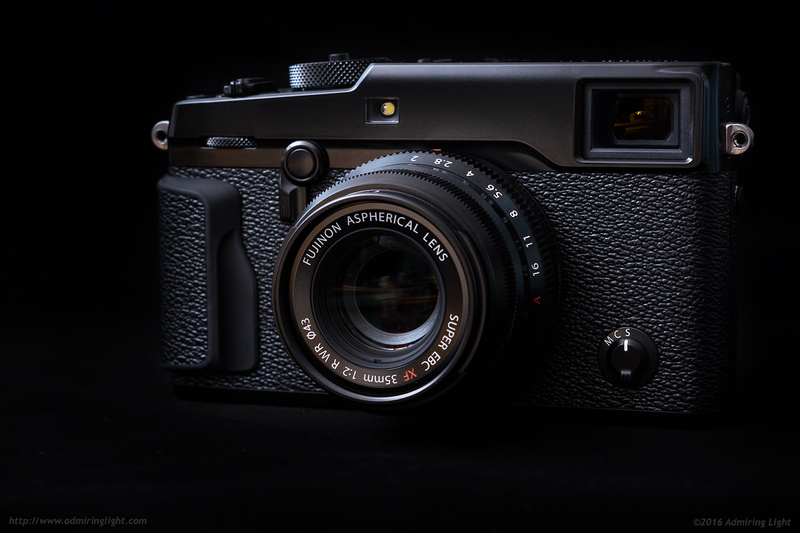 I hope these changes make their way to the X-T2 when Fuji updates that body. Now let’s talk about the main reason why people would be drawn to the X-Pro 2: the hybrid viewfinder. terrific review. Really agree with the conclusion. It is an awesome camera. I returned mine, because the XT-1 just seems to be a better fit for me, my shooting style. Large EVF, articulating LCD made all the difference. First, excellent review, Jordan! You hit on the features, functionality, and most importantly, image quality improvements in the camera. Thanks for your insights as well! Rudy, as a happy XT-1 user (with some stelar Fujinon optics), I too, was hesitant to jump into the rangefinder-style X-Pro2, since I’m not a “street” or portrait guy. My initial thought was to wait on the XT-2. However, upon reading professional reviews such as this one, the improvement in detail and overall image quality, plus the “intrigue factor” with the rangefinder, led me to make the leap! I’m still testing it and comparing image files with the XT-1, but so far, am quite impressed! I’ve made some superb 24×36″ prints from XT-1 files, so really anxious to see what the new sensor can do at that print size! That said, I too, am wanting to see what of these new features will make it into the XT-2. Perhaps at that point, I may sell my XT-1 and then have two bodies with the same sensor. Bottom line though, the Fujinon optics are what really made me go mirrorless, after many years with DSLRs (and SLRs!). Your review makes no sense. First you state how Fujifilm really thinks about how people use cameras and then point out multiple design flaws with the controls. There’s nothing, absolutely nothing in this camera that couldn’t have been sold 2-3 years ago. Fujifilm again has been asleep at the wheel. The flaws I point out are there, but they are minor. ALL cameras have design that is less than perfect. I’ve never seen a camera with ‘perfect’ controls. This was a great review, and I think you hit the nail on the head. I bought the camera a week ago, coming from an X-T1, and before that an X-Pro1 and X100. I loved the X-Pro1, but there were some design and autofocus issues that eventually pushed me to the X-T1, but with the X-Pro2, I think I’ll shoot it till it breaks. You are exactly right about the design flaws, but they are minor. The price is the biggest detractor, but as you say, if it’s the camera for you, then it’s worth the price. Having just a couple of weeks under my belt with the X-Pro2, I am still learning and getting things embedded within my brain so that everything hopefully becomes second nature. I agree you have to want this camera, but did I want it! Coming from the X-100 and X-E1, this has nailed it for me. Specifically, the handling is superb with really fast operation and auto-focus, and the controls tweaked so that everything falls naturally to hand. The image quality improvements and Acros film emulation are the icing on the cake. As well as landscape and architecture, I do enjoy shooting on the street with primes, and the OVF is fantastic for this. Could it be more perfect? Sure. I would love an articulating screen, but I realise this would have added more weight and thickness, so I respect FujiFilm’s design decision on this. Otherwise, I am finding it truly satisfying to use. Thanks for your review! Hi, ‘will it be a good camera for pro Family photography in studio and outdoor ? *Any* recent camera, whether Fuji, Sony, Canon, Nikon, Olympus, Panasonic or Pentax would. “The biggest downside is the price of the camera…for an APS/C camera”. That remains the whole discussion with the Fujifilm X-series. Fuji film is clearly targeting to become the APS/C champion able to withstand all FF competition because of their real, film-focussed photography background. I don’t know myself that’s as well from a technical as a commercial point a wise decision. On the renowned rumor sites there’s a fierce battle going on about needing FF or not, and the superiority of the APS/C X-Trans design. 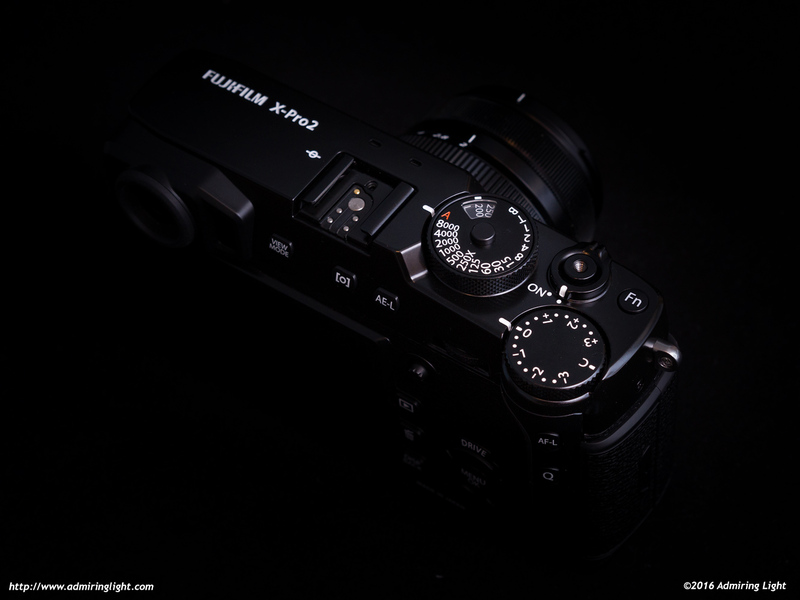 Owning both – FF DSLRs and Fuji X – I’m not fully buying into Fujifilm’s strategy. I’m not even believing the story that XF-glass is really beating anything else in the market – that’s just a myth. If the X-Pro2 would have been received the latest gen Sony 42MP FF-sensor with an X-trans CFA it would have been immediately a Leica M/SL killer and a serious option next to the Sony A7. Now – I don’t know that this choice is even able to sustain a credible future path. The Fuji fanboys seem to be the only ones to take that challenge. Don’t forget that with today’s technology – 24MP for APS/C seems due to the pixel density a bit at the edge of what this size of sensor can deliver without compromises. I’ve read quite a few reliable reviews now of magazines that didn’t end without comments on the DR, noise and even color accuracy at higher iso’s – and another remark too, that always returns, is that the difference with the old 16MP X-Trans is not very impressive. I can’t tell, I haven’t used the X-Pro2 yet but I get more and more the feeling this isn’t the magical upgrade quite a bit of serious photographers were expecting at the end of the day – in particular when it comes to better, usable high ISO-competences. I also agree that the price is unreasonable for this camera. I would’ve been happier if it were selling new in the $1400-1500 range personally. With that being said, I think the FF/APS-C discussions (or wars depending on what site you’re on) are a little ridiculous. If someone can’t make good photos with an APS-C camera, it’s not because the lack of FF. While the ceiling for the APS-C sensor’s performance is near, what more could someone want from a camera? Looking at the images above and at the samples all over the web, it’s easy to see that APS-C camera images aren’t hurting because of their smaller sensor. And from my personal experience, the X-Trans is no slouch when it comes to dynamic range, noise and color accuracy. I haven’t read many reliable reviews that don’t praise the X-Trans sensors for their image quality. A cropped sensor may not be the path to the future, but at the very least, they can definitely coexist as formidable cameras next to full frame sensors. The young girl (your daughter?) uses the same gear as I do. The old, trusty GX1 and the 14mm prime. By the way: I like your photos! In my initial impressions, I came to similar conclusions as you did regarding the X-Pro2, especially about the price. While it’s a beautiful, high-end X camera, the $1700 price tag still seems a bit steep. The joystick is my favorite new feature of the camera. The ISO dial? Not so much. jordan , frankly im appalled at this “review” and feel you should seek professional ……. i understand you were quite taken by sound the shutter makes….. Cool. I’m reviewing the Pen F right now. Neat little camera. As usual, it is well written, clearly presented, and objective. I also like your pragmatic approach in your reviews, ie. using the camera in real conditions. I agree that the price is too high in the current market. One feature I was really hoping to see in the X-Pro2 is the ability to change the auto ISO behavior. Currently, one can set a minimum shutter speed. It’s great with prime lenses, but very sub-optimal with zoom lenses. Fuji should include a mode where the camera choses the shutter speed depending on the current focal length (say 1/FL or 1/1.5*FL). Additionally, one should be able to bias the algorithm toward slower or higher shutter speeds. That’s what Nikon and Pentax implement in their bodies. This makes much more sense when using zooms and also prime. Every time I change lens, I need to change the minimum shutter speed which is a pain and sometime I forget (for instance, 1/40 works well with the 14mm, but will lead to blurry shots with the 56mm). This feature could easily be implemented in a firmware update. I’m not sure why Fuji doesn’t do it since quite a few users are asking for it. I found the review fair and helpful. I love this camera, although I agree it’s a little expensive. I’m getting on in age now, but the thing I like most of all about the X-Pro 2 (as I did about the X-Pro 1) is its capacity to allow me to turn everything off: set the ISO to 400, go to manual focus, aperture and shutter and – hey presto! (to use a technical term) I’m back in 1981 with my Nikon F3, and in complete complete control. Everything else it does – which is a lot – is a huge bonus. Nostalgia meets technology: perfect. I don’t like the old school shutter, it triggers below that barrel that protects it and my fingers hitting that barrel causes camera shake. Maybe I’ll start shooting with my smart phone. And what’s with all the bad issues and defective lenses and bodies I keep reading about? Is Fuji that sloppy with their QC? do all camera systems have so many issues? I love this camera and am still hanging on to my D3 and 24-70 which feels like 20 lbs in the bag. Any ideas On the shutter, how to adjust or get around that issue. Still getting used to the Rangefinder, My Koni Omegas and Press cameras were easier because of their size. Can’t wait to master it though and get some of those Leica like results I keep seeing. This site is the best I’ve found. Thanks Jordan. A few things. If you have trouble with the shutter button, look for a soft release that will screw into the button. You can get cheap ones for $5 or spend $30 for custom wooden ones. Lens QC? Fuji is probably a bit better than average, actually. Reviewing and owning so many lenses over many systems, I have experienced lemons from every manufacturer, including Fuji. No manufacturer is immune to the occasional bad lens. Great review Jordan. Very proper job! Keep on doing the good work! Have to admit, the price here (Netherlands) is even a bit steeper.. 1800 euros thank you very much. Yet, as with the Pro 1, thought about it , thought about it again a little bit, than bought the “silly bugger” and never thought about it again. Never any regrets! The fun, the satisfaction I got/get from these machineries(machinations), the pleasure, the files that come from BOTH! I hesitate between 14mm and 15mm. I am enjoying the XPRO 2 tremendously, but I’m a bit concerned about the camera “warming up” after light usage. (Less than 50 shots.) Is this normal? It’s no where near “over-heating”, however. None of my Fuji cameras exhibit this anomaly. (X100T and XT-1 or any other previous DSLRs.) Have you heard about or have you experienced the “warming?” Thanks for your help. Thats a nice idea about the Panny 14mm Dominique.. any chance of a short review Jordan?.. ps, this a great review of Xpro2..especially your images covering things & people..most helpfull. I love the Fuji jpegs and find it is all i need in street photography.. so thanks again Jordan.